Founders Science Group provides state-of-the-art water testing services. Our analysts are well-experienced in both handling and preparation of water samples and their knowledge reaches beyond the testing process. Our staff evaluates each sample received prior to analysis in order to identify potential sampling errors, which can avoid costly OOS investigations. Founders Science Group can also support cleaning validations. Our team can provide recommendations on study development, sample collection and sample analysis or we can generate a cleaning validation unique to your system’s needs. We are able to come on-site to collect samples to ensure proper collection and handling or we can provide a self-executable protocol, where your in-house team collects samples and sends them to our facility for analysis. Indirect measurement of organic molecules measured as carbon. TOC is used as a process control for water systems, as a process control for water waste disposal, a key parameter for cleaning validations via swab methods to determine residual API and used to determine TOC in individual samples. 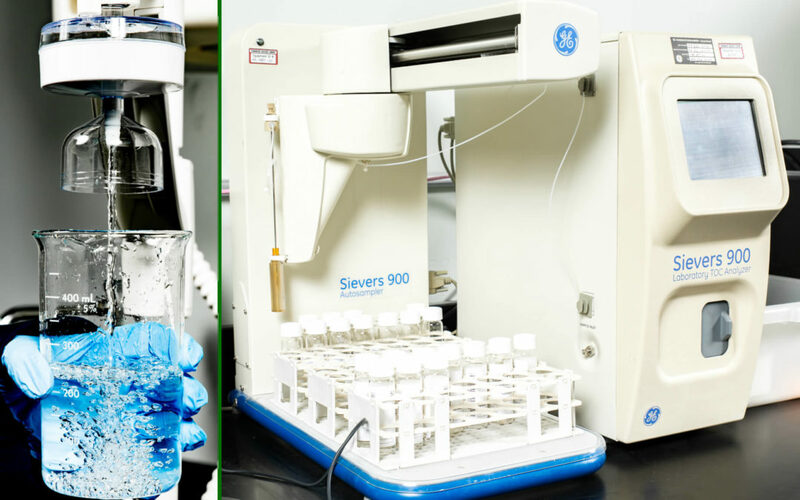 TOC is also a standard water purity test as bacterial growth elevates levels of organic carbon in water which can then be analyzed using this method. Measurement of ion-facilitated electron flow—a water source’s ability to conduct electricity. Used as a process control for water systems and to determine ion concentration in individual samples, such as sodium, chloride, calcium and magnesium. Also used in marine applications as conductivity and salinity values correlate with one another and salinity levels directly impact aquatic life. A measure of the decrease in incident beam intensity per unit length of a given suspension, which means it assigns a measureable value to the cloudiness or haziness of a fluid. Turbidity is caused by suspended solids invisible to the naked eye. Used to indicate water quality, especially in systems utilized for drinking water. A measure of the nitrate concentration via colorimetric analysis. Used to indicate water quality, especially in systems utilized for drinking water. Analysis used to determine acidic/basic attribute of a water sample. pH is a staple test for water samples and can impact the appropriateness of other tests for any given situation. Contact us today at info@founderssg.com or (508) 258-8055 to learn more about our water testing services and to receive a quote! To see a list of our other services click here.